Earth Care's "BAG" can take from one hour to several days to work, but it is very effective since it removes odors versus masking them. It is simple to use and cost effective ! 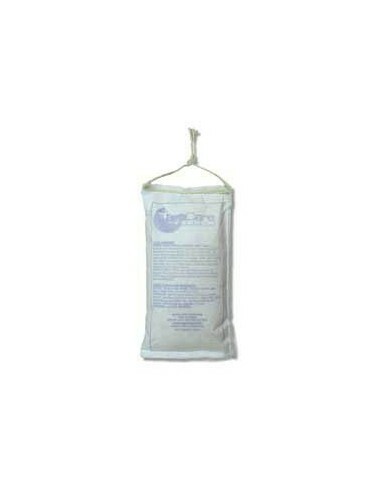 Earth Care's Odor Remover Bag uses a natural earth mineral that is mined and processed to attract and remove smoke and odor molecules, in 24 hours the odor is gone. It's content is odorless, biodegradable, non-flammable, non-toxic, safe around children, pets and mother earth. It is easy to use, lasts an average of 3-4 months in use, or indefinitely in plastic wrap. It contains no chemicals, toxins, or fragrances. Earth Care does not mask odors, it removes them. Coverage of one BAG to a single room is up to 100-200 square feet. Simply hang near odor. Perfect for dead animal odors, skunk odors, dog and cat odors, litter box's, smoke and fire odors, etc. * Does NOT mask odors, it removes them ! - Coverage of one BAG to a single room is up to 100-200 square feet. - Simply hang near odor. - Perfect for dead animal odors, skunk odors, dog and cat odors, litter box's, smoke and fire odors, etc. Perfect for dead animal odors, skunk odors, dog and cat odors, litter box's, smoke and fire odors, etc.